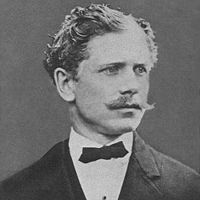 Ambrose Gwinnett Bierce was an American editorialist, journalist, short story writer, fabulist and satirist. Today, he is best known for his short story, "An Occurrence at Owl Creek Bridge" and his satirical lexicon, The Devil's Dictionary. The sardonic view of human nature that informed his work � along with his vehemence as a critic � earned him the nickname "Bitter Bierce." Despite his reputation as a searing critic, however, Bierce was known to encourage younger writers, including poet George Sterling and fiction writer W. C. Morrow. Bierce employed a distinctive style of writing, especially in his stories. This style often includes a cold, dark imagery, vague references to time, limited descriptions, the theme of war, and impossible events. Conservative: a statesman who is enamoured of existing evils, as distinguished from the Liberal, who wishes to replace them with others.